Paper Zee isn’t as impressive as it first looks, once you get down to what they can do. The writing in particular was quite poor, with all the errors that were getting left in them. The fact you can’t get a quote online is quite worrying too. There are other essay sites that are transparent in pricing and offer good writing, so keep looking. Every student has considered getting a paper written for them at some point. Is it worth working with PaperZee.com when you’re in a bind? This review has everything you need to know. Any good writing service needs good writers to handle their essays. Who are the writers here? At time of writing, there are around 50 writers on staff, 9 of whom are based in the UK. There are 13 writers with Masters degrees, and 4 with PhDs. We’re surprised at how few of the writers are located in the UK. If you order an essay, are you more likely to get a writer who’s not a native English speaker? You’re reading this review because you want to know if you’ll get a quality essay from this service. Are they worth your money? We’ve been looking at several different reviews and samples to see what they put out. We saw that in many cases, it was clear that the work wasn’t proofread correctly. Essays were delivered still full of very basic errors, such as spelling and grammatical mistakes. This shows that there isn’t as much care put into the essays as you would think. 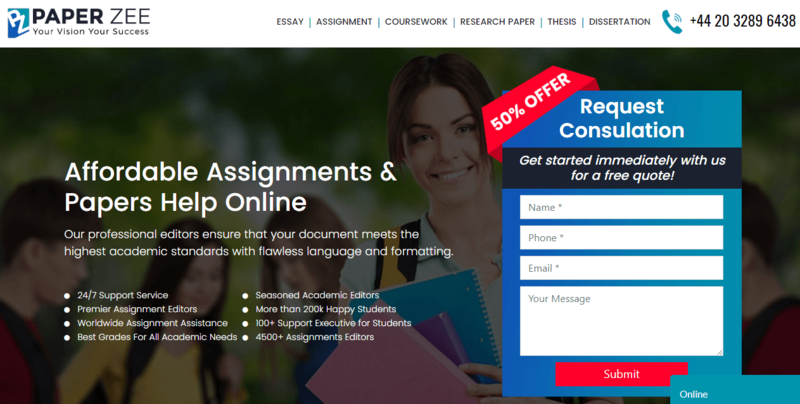 You’ll find with this website that there’s no way of getting a quote on your essay before you get in touch with them. To get a price on your work, you will have to hand over some of your data. That’s not ideal for students that are trying to stay private in their search for a writer. There is a discount of 50% off for new customers, but there’s no additional services that you can buy from them. If you need help with your order, there’s a customer service team ready to help you. They’re available 24/7 via several different methods, such as phone, live chat and email. What some customers have found is once you’ve got in touch, it takes a while to get an answer back about your query. You’ll need to keep this in mind if time is of the essence with your essay.